Passion is the energy that comes from the core of who we are as defined by our unique set of gifts. 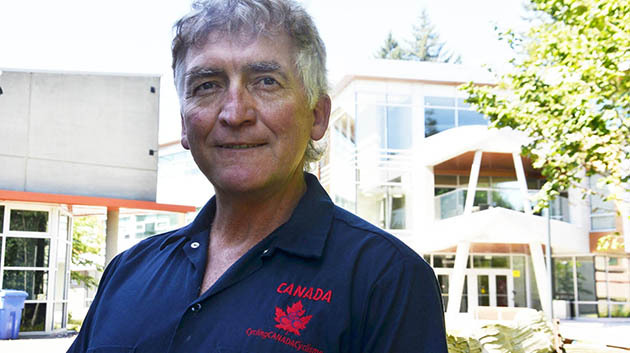 That’s the theme of a panel discussion to be led by sports psychologist Roger Friesen at the University of the Fraser Valley on October 15. Friesen and guest panelists — several of whom are UFV kinesiology alumni — will share their unique perspectives on how they live life passionately in Your Guide to Living and Loving a Passionate Life, part of the Alumni Expert Speaker Series. The presentation will be held on Thurs, Oct 15 from 5:30 to 7 pm in the Great Hall of the new Student Union Building on UFV’s Abbotsford campus. Friesen is a professor, sports psychologist, and adventurer with an engaging perspective about how to harness your energy to live your life passionately. Friesen combines his teaching duties as an associate professor in the UFV Kinesiology program with a thriving consultancy in sports psychology, helping athletes hone their mental game. This summer he was consulting sports psychologist to the Canadian national cycling team, and supported them throughout the Pan Am Games in Ontario. Several of the athletes he worked with won medals at the games. Friesen doesn’t just counsel athletes to reach their peak performance, he practises what he preaches. He likes to set personal challenges for himself so he can relate to what happens in the performance context with his athlete clients. This year, he set a goal of riding from the north end of Vancouver Island to the south in one day on the June 20/21 weekend. He succeeded — completing a ride of 502 km in 21 hours, with the support of his wife and some friends, and an encouraging video text sent from the national cycling team. Ask him how setting personal goals and positive challenges contribute to a passionate life. Friesen has found that sharing stories is a great way of exploring these ideas and finding answers. Jamie Armstrong —is an entrepreneur and athlete who founded Method Indoor Cycling in Kitsilano. Jamie is an accomplished athlete, triathlete, Ironman and recent gran fondo cycling participant. He has a great interest in optimizing athletic performance, based on technique and body movement. Jamie studied Kinesiology at UFV. Zach Bell —is a professional cyclist and Olympian who represented Canada at the 2008 and 2012 Summer Olympic Games. Zach is a two-time world championship silver medalist on the track, and a 16-time Canadian championship medalist on the road and track. He was the Canadian champion on the road in 2013. Zach is also an innovator and a philanthropist. Cheryl Chatwin — Cheryl graduated from the University of the Fraser Valley with a Bachelor in Kinesiology in 2008 before going on to complete her Master of Physical Therapy from the University of British Columbia in 2010. She is also an adventure guide and an entrepreneur. In her spare time Cheryl enjoys biking, paddling, and participating in triathlons. Dr. Rachel Statz — obtained her Doctor of Chiropractic degree with honours from the Canadian Memorial Chiropractic College and received awards for her academic, clinical, and community contributions. Prior to her chiropractic degree, Dr. Statz studied kinesiology and human kinetics at UFV. The series is inspired by the UFV Alumni Association’s mission to engage with current students and provide them with relevant information about career options and the potential for varied experiences in their field and in life in general. The topics presented are also of interest to faculty, alumni, and the general public, all of whom are welcome to attend.